There are just days left in the season’s first half and Minnesota’s first half has been filled with more downs than ups. That being said, the All-Star break can be a time to recuperate and prepare for the second half. Plenty of players struggled for the Twins in the first half. It’s time to turn the page and look for a second-half star. I would hope to see a few big second halves after so many members of the Twins came up well short of expectations in the first three months. If there's one name that really stands out though, it's Max Kepler. In a sense, the outfielder's season has more or less met expectations — his .721 OPS and 98 OPS+ are directly in line with his MLB marks of .732 and 95 coming in, and he's on track to finish right around career norms in most counting stats. But most of us hoped for much more than the status quo from Kepler. His inability to take a step forward has been disconcerting, and a little surprising given the underlying components of his performance. Compared to his previous standards, strikeouts are down for Kepler (15.2% this year, 20.5% prior) while walks are up (11.0% this year, 8.7% prior). His batted ball profiles are also improved, as Kepler is sporting career lows in soft-hit and medium-hit percentage, while his career-high hard-hit percentage of 38.1% ties him with Eddie Rosario for third on the team (behind Eduardo Escobar and Joe Mauer). But despite all these positive indicators, Kepler is batting .229 with just six extra-base hits since the start of June. I can't see that continuing. Eventually Kepler's results will have to start trending up to match the process. I believe we'll see a breakout in the final months with several big games, which would be a hugely reassuring sign going forward. I'd love to say Byron Buxton, but it's not clear to me how much longer he's going to be down in Rochester ... or what the situation there is, exactly. Instead, I'm going to go with Mitch Garver. Garver has already started to catch fire, as he's actually the team leader in both batting average and on-base percentage since late May. He hit just .220/.281/.341 (.622 OPS) over his first 89 plate appearances of the year, but then turned things around to post a .320/.400/.453 (.853 OPS) over his next 85 plate appearances. I think what we're seeing is a guy becoming more comfortable. Now that he's caught fire, here's hoping he starts to also catch more baseballs, HA! I wasn't a big fan of how Garver was handled in the minor leagues, and I think we're witnessing some of the problems his relative lack of reps behind the plate has caused. Still, I do think he's looked better of late, and here's hoping a familiarity with the pitching staff fosters more comfort. He'll probably never be best suited as a primary catcher, but I believe Garver's bat is good enough for him to get reps at first base or DH. He's exactly the type of player the Twins should go out of their way to give opportunities to in the second half. Something needs to click with the starting pitching and I think Jake Odorizzi is going to make some strong strides in the right direction during the second half. His strikeout rate is over 9.3 SO/9 for the first time in his professional career. He’s also been keeping the ball in the ballpark at better rate than the last couple of seasons. Both of these things could help him to improve down the stretch. Entering this season, he carried a career 1.22 WHIP with an 8.0 H/9 and a 3.0 BB/9. This season his WHIP has ballooned up to 1.42 because he is giving up more hits (8.7 H/9) and more walks (4.1 BB/9). June was a rough month with an ERA close to 6.00 and a 1.68 WHIP. With the calendar flipping to July, Odorizzi seems to have found something he was missing in the beginning of the year. Jose Berrios as the ace and Odorizzi and Kyle Gibson behind him could be a strong top of the rotation in the second half. There have been many Twins players who have underperformed during the first half, and one would assume that at least one or two of these guys would bounce back and have a big second half. For me I’m looking at Logan Morrison. While we knew going in that it was unlikely Morrison would repeat his success from 2017, it wasn’t exactly like Morrison was a slouch before then either. While his first half numbers haven’t looked all that appealing at .192/.289/.357 with 10 home runs, Morrison has the potential to find his home run stroke and break out at any second. Logan Morrison’s peripheral numbers also support the case that he will have an improved second half. The first glaring number that sticks out to me is his .212 BABIP. While Morrison is the ideal candidate to have a lower BABIP than most given how often he is shifted against and his lack of speed, but at .212, he is still well below his .268 career average. The Statcast metrics also support the case that Morrison has been hitting the ball better than his results show. Here are what a few of Logan Morrison’s actual stats look like compared to his expected stats via Statcast. Those are all really big gaps that suggest that Logan Morrison has been hitting the ball much better than his results show. I believe that Jorge Polanco will have a big second half (or, first half for him? ), I think he'll wind up hitting second or third for much of the second half and do well. If you've been to the last two Twins Daily Winter Meltdowns, you heard me answer the same question the same way each year. During the Twins Daily panel round table, we've been asked who we think will lead the Twins in home runs. Both years, I've answered "Max Kepler." 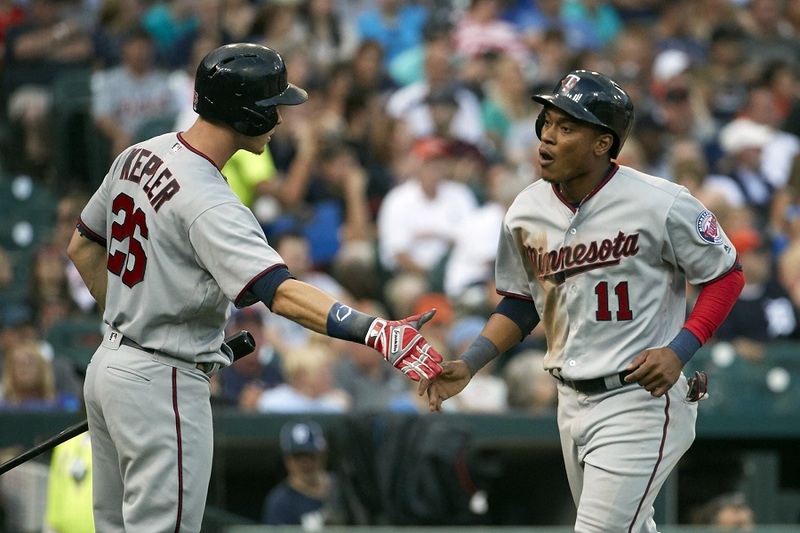 It's been a somewhat disappointing first half for the Twins outfielder, but he's shown signs. His improved approach and improved results against left-handers is encouraging. With that approach, the numbers against right-handers should bump up. Kepler has so much talent and a ton of power potential. At some point it's going to click for him. Maybe it will be in the second half. It might be the easy answer, but I think the second half is going to belong to Jorge Polanco. He proved it last year by hitting 293/359/511 after the break and will have the added motivation of having let his team down/proving it wasn't a PED-enhanced stretch of hitting. When you look into the crystal ball of the Twins infield, there is very little certainty. But one thing is certain: Jorge Polanco is going to be in it for the foreseeable future. His second half is going to prove it. For me, it's Jorge Polanco. Regardless of how you feel about Polanco's suspension, he was a key catalyst for the Twins' outstanding second half last year. In the second half, Polanco hit .293/.359/.511 with 10 HR and a wRC+ 128. He'll be looking to replicate that form to spark a pedestrian Twins offense which should benefit from having the second easiest second half schedule in all of baseball. Polanco was right around an average defensive short stop in 2017, it'll be interesting to see if he can build upon that and cement his position in the field. If not, he may find himself moving to second base when Ehire Adrianza returns if Brian Dozier is traded. Either way, Polanco will feel like he has something to prove to a team he let down in the first half of the season. I think the easy answer here is Brian Dozier if we're looking at nothing but track records. That being said, I think the two most intriguing options are Max Kepler and Jorge Polanco. A year ago, Polanco was arguably the Twins greatest player down the stretch. He's still settling into the lineup after missing half the season due to his PED suspension. While Adrianza filled in fine, I thin we'll see some offensive firepower from Polanco sooner rather than later. On Kepler, I just can't believe he's going to scuffle like this all season long. He looked so great out of the gate and has gone in the tank of late. I'd be far from shocked if he doesn't use a hot stretch to get it going. Assuming the question is, “who do you expect to have a big second half FOR THE TWINS,” I’m going to go with Jorge Polanco. He’s a guy who has not been tainted by having to go through the frustration of the first three months of the season and I suspect he feels he has a lot to prove, coming off his suspension. If he’s traded (and accepts the trade, of course), I do think Joe Mauer could have a terrific second half of the season somewhere. I happen to think he’d be a great fit for the Yankees or, to a lesser degree perhaps, in Cleveland. If he suddenly found himself on a team that’s virtually a shoe-in for the post-season, I think he’d be very focused and very motivated. If I was fully confident that he'd be around for it's entirety, I'd peg Brian Dozier as that has seemed to be his M-O over the past few seasons. But since I'm not that confident in that happening at this point, I'm looking at #DasWunderkind, Max Kepler. I'm not going to dig into numbers to describe it, but I've had the impression Kepler's overall numbers should be better than they currently are. For the first month of the season he was looking great and continually having fantastic at-bats. He had even worked himself up into the number three spot in the lineup. Then... I'm not sure what happened. As Eduardo Escobar and Eddie Rosario heated up, he no longer was getting those big hits. Kepler had been my favorite prospect to follow since watching him play Spring Training games on a roster that included Rosario, Miguel Sano, and Kennys Vargas. That experience all the way back then made me believe he'd become the best overall player of the group. Let's say that starts coming to fruition after the All-Star break. Berrios ... He's got it, and he wants it the most. I have a feeling we'll see a reinvigorated Sano, who will look a lot closer to last year's first half. Kepler or Romero (once they call him up) are my guesses. And, they are pure guesses. My first pick is Dozier as he has been hitting better lately in the power department.I'm gonna go with .270/.350/.550 with 15-18 2Bs and 12 -15 HRs and 6 stolen bases to get to 101 for his career with the Twins. I think Morrison will do better if he stays the full season something like .240 average with 12-14 HRs but wont be the breakout player for the second half. I think Rogers will do well out of the pen with 2.5 ERA in 36 innings (I'm reaching here as I feel like most of the rotation pitched to potential).Otherwise i gotta go with Romero with a low 3.00 ERA when he gets recalled soon.Maybe 70 innings of 3.20-3.40 ERA and 75 Ks. The FO is the key to this question. Who and when will they bring up Sano/Buxton/Romero?Any of those three would be my choice, but if the FO continues to be a mystery I am going to say Rosario is going to have two great halves. I think the best second half is going to come from Berrios.I would really like to see him keep having success and keep making the adjustments that will enable him to be the Twins ace for years to come.On the batting side, I think the safe money is on Rosario, but I wouldn't bet against one of the young underachievers (Buxton or Sano) to come back with a vengeance if they don't spend too much time in the minors. Polanco should have been exempted from the poll; as he didn't really play in the first half. Any production--even average production--will make such soothsayers seem correct. Stephan Gonsalves- if they ever bring him up! Hopefully it WILL be Polanco, to prove that last year wasn't all PEDs. Reading through everyone's responses reaffirms yet again how crappily the offense has played--and how much potential this team has. The writers were fairly convincing in their reasons, so I can believe it is possible. The Twins had two "stars" the first half, imagine if they had 6 or 7 in the second. So many choices of players who could and should break out in the second half. I'll roll the dice and pick Buxton as my (very hopeful) choice to click. Dozier, if he's still with the Twins. I think he'll be traded, so my alternate pick is Polanco. I think the whole offense will improve a lot. I expect Sano to return and hit well after the break, Kepler can't have a .245 BABIP all year, and Polanco extends the lineup. I'm going out on a limb, but I think Buxton will help the team too. The bench/DH will be better because of the three additions to the roster (Sano, Polanco and Buxton). I'm assuming Escobar stays with the team. If he goes along with Dozier, the offense will be about the same as the first half. Polanco, Kepler and Odorizzi are easy guesses. What about surprises? Is anybody on the 25 right now going to shock the world? Watch out for Bobby Wilson. Last few games, I like his swing. He looks like he's been seeing the ball really well. Short hot streak, or a trend? That's the dilemma. Backup catchers don't get a lot of consistent reps, but Wilson is now getting them. Sometimes a guy will shock the world by suddenly "figuring it out" at the mlb level. Bear in mind that by "shock the world" I'm talking about maybe batting .265. That's a lot higher average than he has maintained so far. Singles, a few doubles, sac flies, an occasional dinger, but lots of professional at-bats. Would that not entertain us as Twins fans? He is on fire at Rochester hitting .419/.455/.839 for July. I dunno, these players with low BABIP are hitting into the shift and making weak contact. Kepler and Morrison both fall into that category in my opinion - I can see him maintaining their low BABIP. I pretty much agree. When he gets pull happy, he hits a lot of weak grounders to the right side. But I've liked the way Kepler has hit the ball hard to the left side the past few games. I'm betting he'll be better than the last few months. Then again, I'm hoping Buxton returns and now I hear he's been pulled because of a hand injury at AAA. Probably should just totally agree with you.